and learn to be healthy, friendly and wise. and there are good things that we can do. as we jump and we skip through this colorful day. Twinkle says let's make every day special and grand! So, get up, get up, Glo and give me your hand! 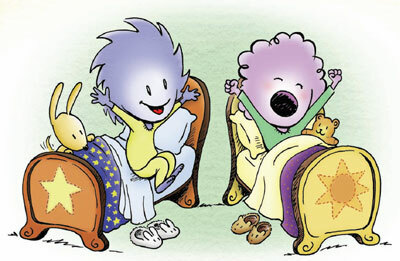 From the moment they wake up in the morning, Twinkle and Glo make positive choices! Choices that steer them away from bullying, obesity, illness, school failure and dangerous strangers. Choices that lead them to good nutrition, safety, fun books and good friends. Choices that children make every day of their lives. This book is distributed free to 5-year-olds, and all sales profits benefit children's health, literacy and community building! There's lots to remember for every day. Eat right, be safe, know the right things to say. “Not only did my kids respond in tangible ways to the messages shared by Twinkle and Glo, but they loved reading the rhyming text. A positive, healthy message that's fun for kids to read. 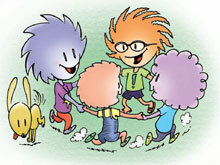 In a light-hearted and loving way, Twinkle and Glo teach young children important lessons about life!